Neutrogena Rapid Wrinkle Repair Serum needs to be on your radar if you are someone concerned with anti-aging. Are you doing your part to fight signs of aging now that you’ve reached a certain age? You’re probably wondering when the right time is to start an anti-aging regime, right? Well, I will tell you. The answer is… today. Don’t wait for wrinkles to take over at full force. It’s never too late… but you might as well get a jump start to it all. Start thinking about anti-aging products when you are on the cusp of a change. Today is your day, my friend. Join me on this wonderful ride. I promise you, it can be fun if you have the right mindset. We are fighting the sands of time. And thanks to technology… we are winning. Many dermatologists agree that retinol and a broad-spectrum sunscreen help fight the signs of aging because exposure to UVA rays can lead to premature fine lines, deep wrinkles, and uneven skin tone. Easy enough, right?! All you have to do to truly make a noticeable difference on your skin is purchase products that focus on these offerings. I took a week long test and kept a visual diary highlighting how Neutrogena Rapid Wrinkle Repair and Ultra Sheer Sunscreen changed my skin and the results are in! The Ultra Sheer® Face & Body Stick: Has a wide-faced form that glides on easily and invisibly. This product offers protection from skin-aging UVA rays and skin-burning UVB rays, so you can have clean, shine-free protection on hand, while on-the-go. The Ultra Sheer® liquid sunscreen: Has a water-like texture that works well over moisturizer or under foundation. The perfect complement to a daily makeup routine. Rapid Wrinkle Repair® Moisturizer Broad Spectrum SPF 30: Featuring a unique combination of Retinol SA, Glucose Complex, and Hyaluronic Acid, Rapid Wrinkle Repair® Moisturizer moisturizes and renews the look of skin throughout the day, and helps to smooth wrinkles fast and diminish the look of age spots. Rapid Wrinkle Repair® Eye Cream and Serum: By combining a unique combination of Retinol SA, Glucose Complex, and Hyaluronic Acid, these products renews the look of skin throughout the day. To learn about the full line, be sure to click here. As a reminder, Neutrogena Rapid Wrinkle Repair Serum is my FAVORITE. 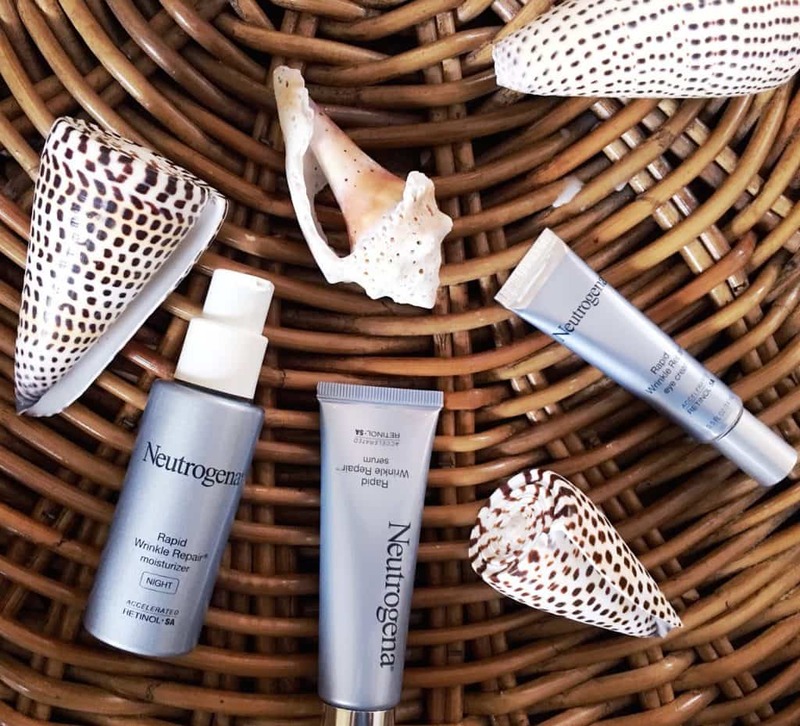 Pairing Neutrogena Accelerated Retinol SA with Helioplex Technology work together to form the ultimate anti-aging power duo! Neutrogena Rapid Wrinkle Repair is the fastest retinol formula available and delivers noticeable results in just one week. And just in case you didn’t know, Retinol is the #1 Dermatologist recommended anti-aging ingredient. 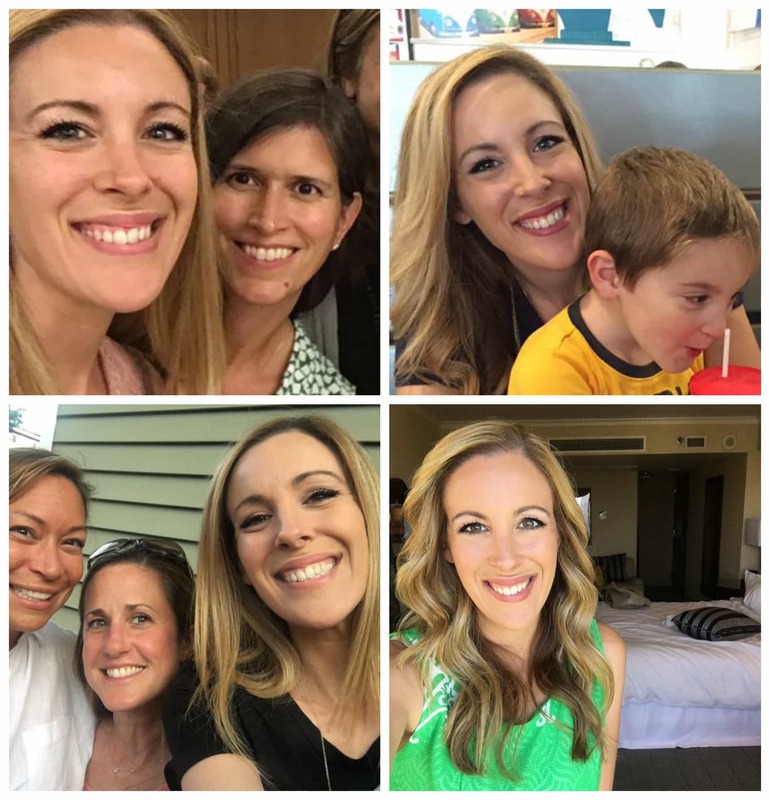 Whether I was hitting the beach, hanging out with my girlfriends or spending quality time with the kids, I knew that it was important for me to protect my skin – day and night. Having the Ultra Sheer Face & Body Stick was major because I was able to reapply as needed. I never had to worry about anything spilling or spraying in the bag. This “on the go” travel item is a MUST OWN for sun lovers and skin protectors alike. After doing this mini, 7-Day test, I realized that I will never leave home without this product AGAIN. Every morning, I applied a base of protection to my skin before I started my makeup routine. 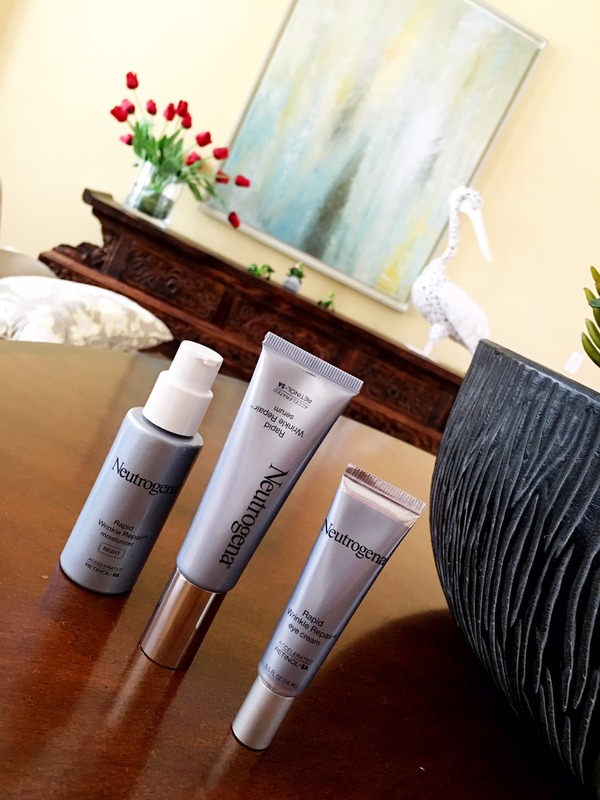 First, I started with the Rapid Wrinkle Repair eye cream and serum because if I am being honest with you – my eye region is where I feel like I need to focus on the most when it comes to my face. What can I say? I laugh a lot! After continuous use, you’ll notice fading stubborn crow’s feet, too. THANK YOU! Happy to report that I saw noticeable results after just 7 days. If you are looking to smooth out fine lines, this regime is so simple and just perfect for you. Before applying any foundation, every woman should add a layer of sunscreen to their skin. The Ultra Sheer® liquid sunscreen doesn’t feel greasy at all and glides on as smooth as can be. One of the things I worry about the most when it comes to sunscreen is how heavy it can be on my sensitive skin. Neutrogena does not have that effect on my pores at all. For someone that breaks out all the time, this is a total WIN. Thanks to Retinol and my new sun care regime, I saw a noticeable difference. Neutrogena Rapid Wrinkle Repair is the fastest retinol formula available and delivers noticeable results in just one week. Retinol is the #1 Dermatologist recommended anti-aging ingredient. It helps fight signs of aging by enhancing surface skin renewal to complement the skin’s natural processes and to visibly improve signs of aging. Neutrogena Rapid Wrinkle Repair also contains Accelerated Retinol SA, which is a scientifically proven to be superior to other forms of Vitamin A in its ability to penetrate the skin’s surface. It’s clinically proven to visibly improve the look of wrinkles, fine lines, tone, and texture while being gentle to the skin. Neutrogena Rapid Wrinkle Repair and Ultra Sheer collection are available for purchase at CVS and/or CVS.com. Ready for a Giveaway? I want everyone to try Neutrogena Rapid Wrinkle Repair Serum. 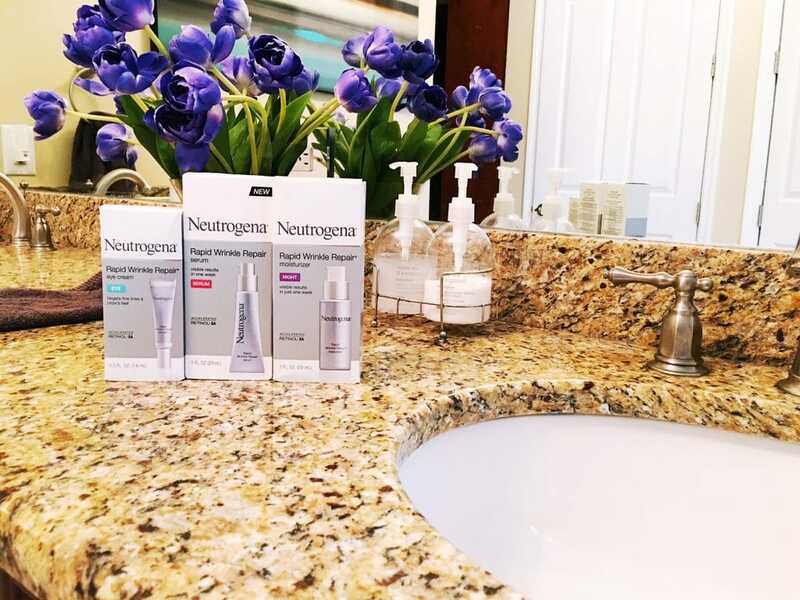 If you are looking to try out this Neutrogena line yourself, I have a wonderful contest for you to enter! Simply use the form below to enter to win. Enter to win a pack of Neutrogena Rapid Wrinkle Repair & Ultra Sheer goodies! 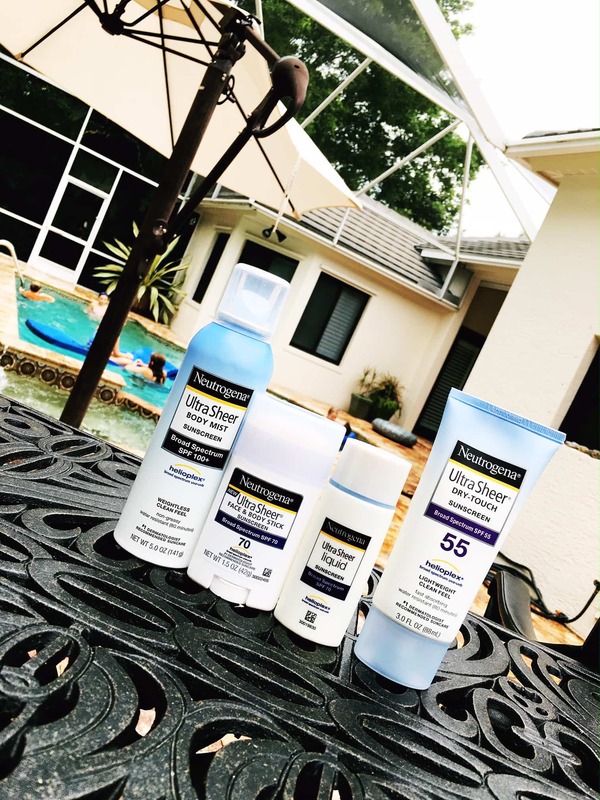 Giveaway will include: Neutrogena Rapid Wrinkle Repair Night Moisturizer, Neutrogena Rapid Wrinkle Repair, Moisturizer Broad Spectrum SPF 30, Neutrogena Rapid Wrinkle Repair Serum, Neutrogena Rapid Wrinkle Repair Eye Cream, Neutrogena Ultra Sheer Liquid Daily Sunscreen Broad Spectrum SPF 70 and Neutrogena Ultra Sheer Face + Body Stick Sunscreen Broad Spectrum SPF 70. Previous Post: « The #HealthiestYouEver Culturelle Community Can Get You Moving! Neutrogena products are the only ones I use. They really help my skin stay soft and nice looking. This stuff sounds great! I really should start using these products on my face. I am nearing 40 years old and haven’t had to worry about aging too much over the last 20 years. I do suffer from acne, though, it is annoying. Those products sound great. I should get some of these and start using them. I don’t think it’s ever to early to try these products out. I’m surely not getting any younger and although I don’t have wrinkles yet, I do have fine lines already. I would love to try the Neutrogena line! 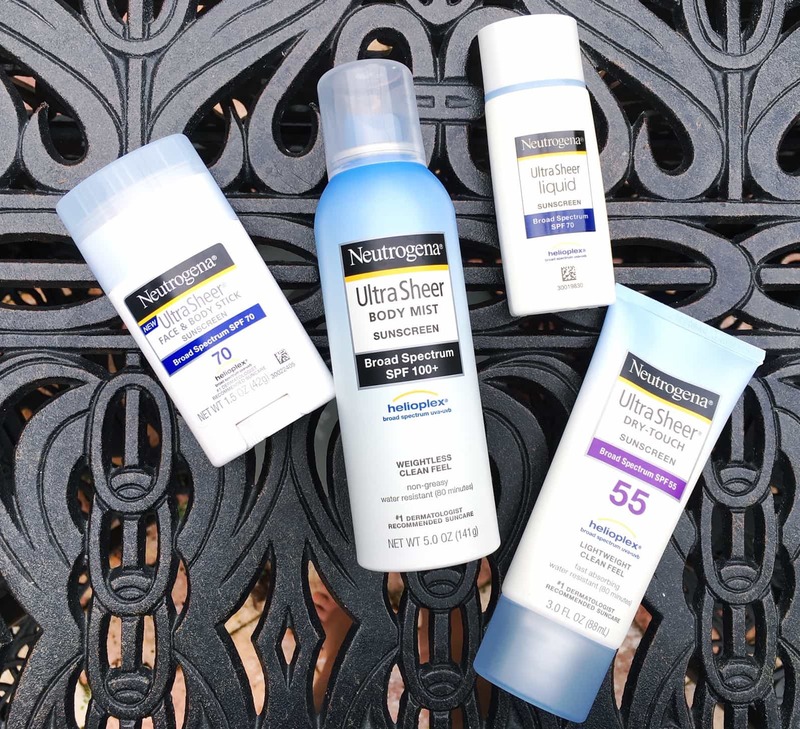 I LOVE the Neutrogena products! All of the lines are so great and the anti aging line is just as good!! Love this! Wear SPF daily even if it’s just in your foundation or moisturizer to protect your skin. Wear white and a wide brim hat. My best anti aging beauty tip is to drink lots of water every day! I try to stay in the shade when outdoors. Always wear a daily sunscreen. Wear sunglasses and dont forget to put the sunscreen around your eyes!